While this cheerful bouquet is inspired by the old-fashioned dessert, blueberries and sweet cream, we believe it’s best described by one word: fresh. With a rise-and-shine mix of yellows and blues, it has the distinctive ability to make any occasion more joyful. Full bouquet is bursting with High and Yellow roses, blue hydrangeas, Euroblue delphiniums, Jade trachelium, White Sizzle chrysanthemums. 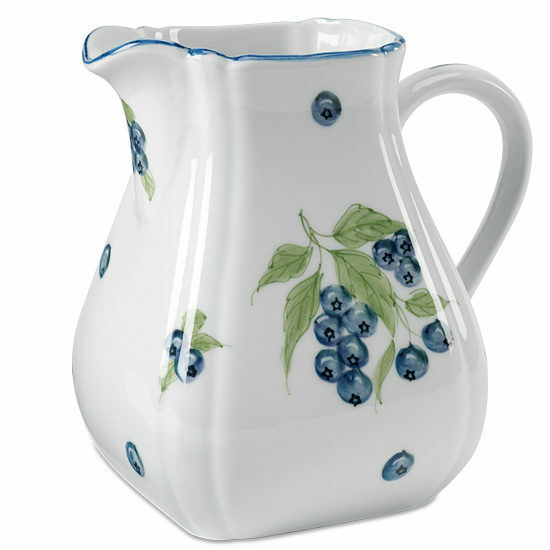 Displayed in a food-safe ceramic pitcher with an allover blueberry motif. Remove all foliage that will fall below the water line on all stems. Remove the “guard petal” on each rose – this is the outermost petal left on to protect the bud during shipment. You may also remove any petals that may have slightly bruised during shipping. IMPORTANT! We recommend cutting all stems underwater for best blooming results. Hydrangeas may look a bit tired upon arrival. Don’t despair! They’re healthy – just thirsty. They will rehydrate and perk up within 24 hours. Always add fresh water daily. Change water and re-cut stems every other day.